A millions of pesos will be given away as a rewards for the killer of Drug lords in the country. President-elect Rodrigo Duterte frankly said that during 'Du31 Thanksgiving Party' at the Crocodile Park in Davao City on Saturday night. Duterte seriously said that if the drug lords still alive, the officer will only get 4 million and 999 thousand pesos but if he killed it, he will get the exact amount of 5 Million pesos. Duterte said, "Ang bayad ko ngayon, pagka-drug lord P5 million 'pag patay. Kung (buhay), P4 million 999 thousand lang." Not only that, incoming president Duterte also offer reward to those officers who can arrest and kill drug distributors. On the other hand, Duterte also urged the public to do the citizen arrest for the suspected drug pushers, and even kill the pushers if they are armed and would resist arrest. He said, "Kaya kayong nandiyan sa neigborhood feel free to call us, the police, or do it yourself if you have the gun. Inaaresto kita bilang isang kriminal and I am invoking the criminal law of the land on the selling of shabu. Sumama ka sa akin sa istasyon. I have to bring you to the (police) station." But Duterte did not told clearly if the reward could also be given to the civilian who arrested drug pushers or even the drug pushers killing. Do you agree with the command given by the incoming president Rodrigo Duterte? Please share your thoughts below. 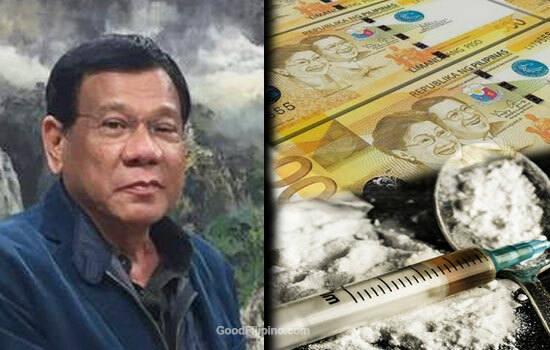 Comments or suggestions about "Duterte offers 5 million pesos as rewards for Drug lords’ killers" is important to us, you may share it by using the comment box below.